Rice feeds over half the world’s population and is a staple food for many countries, but it also features prominently in various cuisines from the Middle East to the Mediterranean. 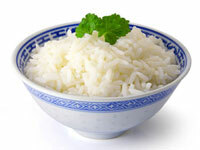 Rice can be served as an accompaniment, as a main meal or a dessert. On its own, it has quite a bland flavor. So it is best served with other spicy or highly flavored dishes. Deciding how to cook rice will depend on the recipe and the type of rice you are using. Different size grains have different cooking properties and of course there are big differences between white and brown rice. Long-grain varieties are four to five times longer than short-grain and medium-grain and so absorb flavors more readily. They contain less starch and so remain separate during cooking. 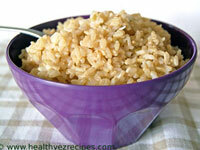 Short-grain rice is plump, almost round, contains more starch and cooks into soft grains that cling together. Always use the rice specified in the recipe, don’t try to substitute, or the results will simply not be the same. Learning how to cook each type of rice and the different cooking methods means you will be able to cook perfect rice all the time. Bring 1 ½ cups water (or stock) to the boil in medium heavy based pan. Stir in 1 cup rice. Bring back to the boil, cover the pan and steam over a very low heat until the rice has absorbed all the water and is tender, abut 15 – 18 minutes for white and 35 – 40 minutes for brown rice. Do not remove lid during cooking time. Remove pan from heat, stand, covered, 5 – 10 minutes. Fluff with a fork. Combine 1 cup rice and 1 2/3 cups boiling water in ovenproof dish, stir well. Cover tightly with foil or lid. Bake in moderate (180ºC / 350°F) oven for about 20 – 30 minutes for white rice and 35 – 45 minutes for brown. Cooking time will depend on many factors, including how well baking dish is sealed. Stir through with a fork to fluff. Bring plenty of water to the boil in a large pan, add rice, stir to separate grains. The ratio is 2 cups of water of every cup of rice. Boil, uncovered for recommended time (about 12 minutes) or until rice is just tender stirring occasionally then drain. 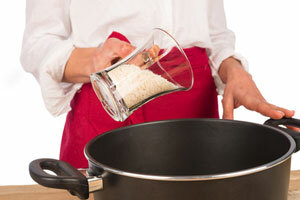 Combine 1 cup rice and 2 cups boiling water in a large microwave-safe bowl or jug. Cook, uncovered, on HIGH for about 10 minutes or until rice is tender. Stir halfway through cooking. Cover, stand for 5 minutes. Fluff with a fork. Probably one of the easiest methods for cooking rice as it always produces excellent and consistent results. Uses the absorption method. Follow manufacturer’s instructions for quantities of rice and water. When cooking is complete, stand rice, covered for 10 minutes on the automatic “keep warm” mode. This method is used to make a pilaf. Heat oil, butter or a mixture of the two in a saucepan over moderate heat. Add the rice and stir to coat the grain. Saute for 2 – 3 minutes, stirring constantly. Add the required quantity of water or stock. Bring back to the boil, then cover and steam over a very low heat until the liquid has been absorbed. Before cooking the rice, place it in a colander and rinse under running water for about a minute or until the water runs clear. This removes excess starch and prevents the gains sticking together creating a light, fluffy rice. Avoid over-cooking rice. To test if ready, taste a few grains, they should be firm with some “bite”. 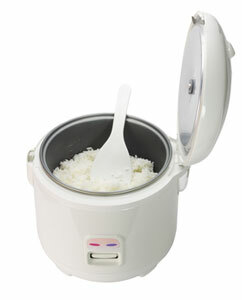 Use a heavy-based pot for cooking your rice. This will prevent it burning. Do not rinse cooked rice except for salads or unless specified. White rice almost triples in bulk when cooked. Brown and wild rice double in bulk when cooked. Reheat rice until piping hot. Avoid reheating rice more than once. Reheat rice in microwave on high for 1 – 2 minutes per cup. Place rice in a microwave proof dish or use an oven bag. 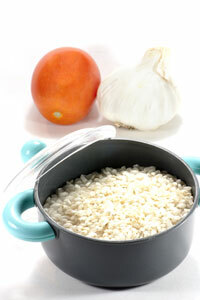 Place rice in a colander, stand colander over a pan of simmering water. Cover with a lid to prevent the steam from the boiling water escaping. Add just enough water to a frying pan to barely cover base. Bring to the boil, add rice, cover, heat until water is absorbed. Spread rice into greased, shallow oven proof dish, sprinkle with a little water or milk, dot with butter. Cover and heat in moderate oven. Store uncooked rice, tightly covered, in a cool, dry place. Check the “use by” date for a guide to keeping times. Brown rice should be stored in a cool, dark place for not more than 3 months. Cooked leftover rice should be covered to prevent drying out, and then refrigerated to prevent spoilage. 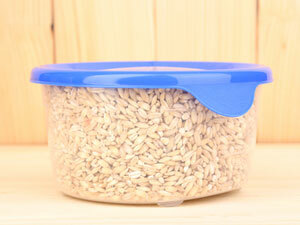 Leftover cooked rice can be stored, covered, in the refrigerator for up to 2 days. To freeze, wrap securely, and store for up to 2 months.